MAB Viewer Tool is a fast & secure tool to open .mab file of any size and type. This tool can open & view MAB file as well as open abook.mab file, view history.mab file and read impab.mab file. Mozilla address book viewer allows viewing multiple times without Mozilla Thunderbird environment. There is no loss of any important contact details. 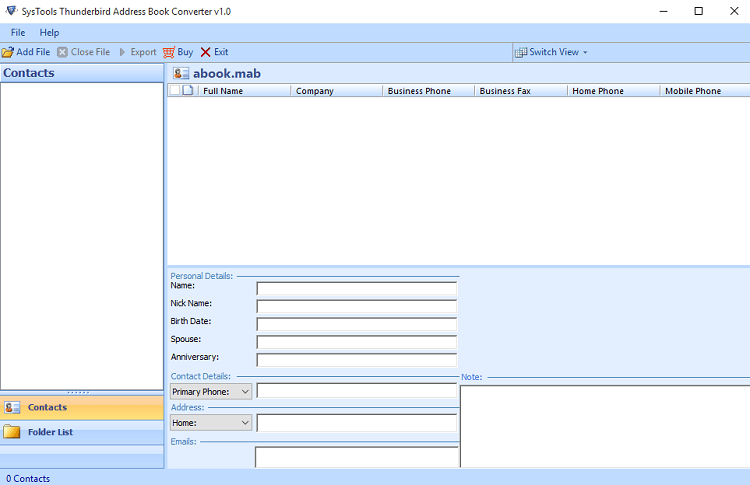 MAB Reader Tool browses .mab file with attributes such as Name, Email Address, Nickname, Home Phone, Work Phone, Fax, Pager, Organization, Home Address, Organization Address, Web page, etc. Open MAB file with attributes in original format without loss of data. Read abook.mab file, open history.mab file & view impab.mab file with properties. MAB Viewer Software provides View mode which contains two Screen Mode option. View contacts by either Horizontal view mode or Vertical view mode. Mozilla Thunderbird Address Book Viewer offers two view modes as per user convenience, this is very useful option to view MAB contacts in any screen view. The MAB Reader Software is supported by all Windows OS versions such as 10, 8.1, 8, 7, RT, Server 2003, Server 2008, Vista, XP, XP SP2, etc. Open Mozilla Address Book of any type such as corrupted or damaged or any size like 100 MB. from Address Book of any Mozilla Thunderbird versions such as 45, 38, 31, 24, 16, 15, etc. 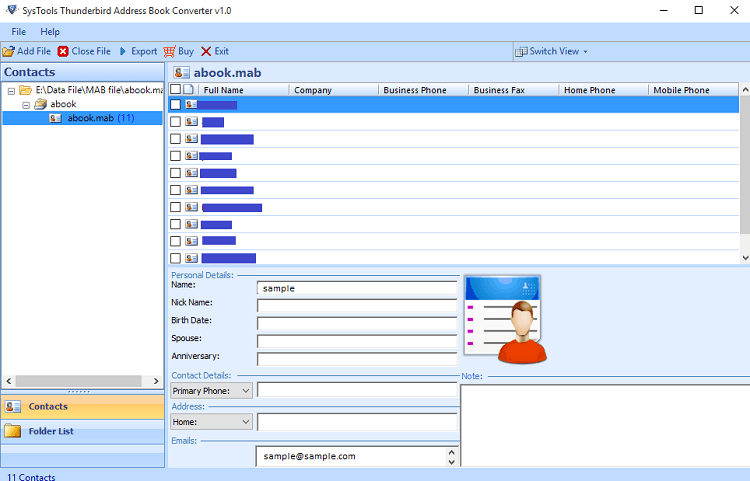 Demo Version of MAB Viewer Software will Preview MAB File Contacts Only. Explain how MAB Viewer Application Works? Step 4: Now, it shows the preview of emails with attachments. MAB file format is an address book which used by Mozilla Thunderbird and contains contact information like Name, Email Address, Nickname, Home Phone, Work Phone, Fax, Pager, Organization, Home Address, Organization Address, Web page, etc. 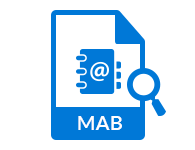 What is Abook.mab, History.mab and Impab.mab file format? 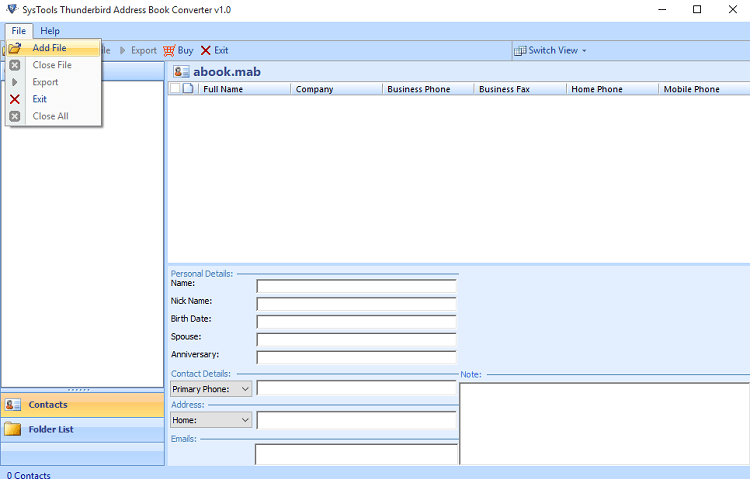 Mozilla Address Book contains three .mab files which are abook.mab is a default personal address book to store contacts saved by Thunderbird, history.mab keeps a history of all collected addresses and impab.mab is used to store imported contacts or address book. How can I view MAB file if it's not opened in any application? Yes, You can open MAB file if it’s not open for any application. 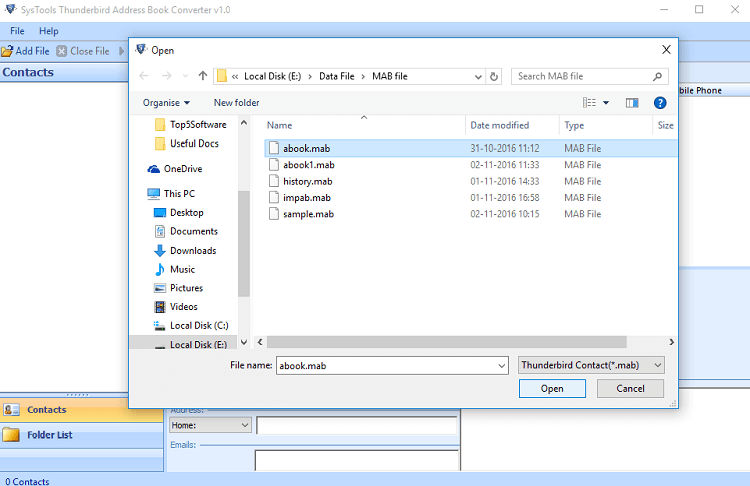 MAB File Viewer software capable of reading any kind of damaged or corrupted Mozilla Address Book files. Is the Mozilla Thunderbird environment is necessary to open MAB file? No, MAB Viewer doesn’t require Mozilla Thunderbird environment to read .mab file. A user allows viewing .mab file in multiple times. Can I view Mozilla Address Book supporting files(abook.mab, history.mab, impab.mab)? Yes, You can view abook.mab file, read history.mab file and open impab.mab file by Mozilla Address Book Viewer. Is there any platform dependency to open .mab file by MAB file viewer? 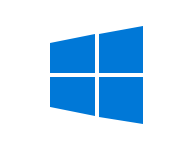 No, MAB File Reader software allows of view MAB file from any Windows 10, RT, 8.1, 8, 7, Vista, XP, XP SP2, Windows Server 2003 and Server 2008. "One of the best tool to open Thunderbird MAB file format. One can easily explore Mozilla Thunderbird Address Book files and view MAB file in a simple manner without getting corruption in data. It is really nice MAB Viewer software." 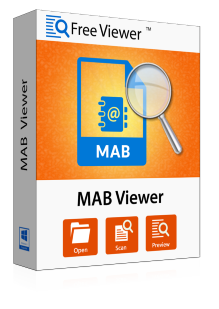 "FreeViewer MAB File Viewer is a Finest developed application that can open and read MAB file. It offers many notable features like Dual view option and Smart search option. It is such a great tool to explore address book with all its attributes. Thanks!" "I am surprised with the smooth functioning of the Mozilla Address Book Viewer utility. It was hard to believe that this application is quite easy to handle for non-technical users." "I must say that MAB Viewer tool is an amazing application as it provides a number of features in a single utility. I am impressed with the development team of this tool. Hats off to your efforts!"